A generation after the events of The Long Earth, humankind has spread across the new worlds opened up by “stepping.” A new “America”—Valhalla—is emerging more than a million steps from Datum—our Earth. Thanks to a bountiful environment, the Valhallan society mirrors the core values and behaviors of colonial America. And Valhalla is growing restless under the controlling long arm of the Datum government. This sequel felt rougher than the first, less Pratchett-y, and less engaging. They've taken an interesting idea and seem to be spinning it out into a patchy and frustratingly loosely connected series. I'll probably read the inevitable third book, because they're still enjoyable and an easy read, but I'm not in any hurry for it to come out. Not particularly recommended, and in retrospect, even less likely to recommend anyone pick up the first book. A decent read. Strangely addictive. I think now that you mostly know the characters it reads a lot better than the first. I still love the idea of the "Long Earth," and that's what really makes it a pleasure to read. Despite the disappointment of the first book, I decided to give the series a second try. I won't be giving the series a third try. 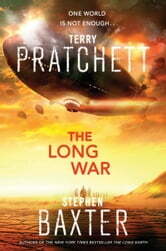 You can't find Sir Pratchett's wit anywhere in the book, and as for the plot...well, there isn't one. Original sci fi concept. Too sparse on origins of discovery & vague references to understory plots.